I am quite excited to announce my very first giveaway! 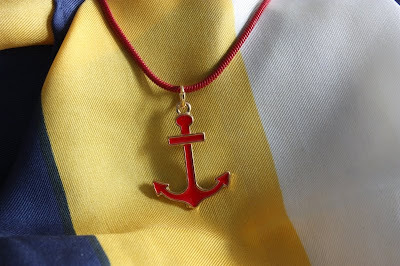 To celebrate the impending arrival of spring, I'm giving away three items in my favorite trend of the season - things concerning sailors or maritime. The anchors, the stripes, the crisp navys and whites - I've already added quite a few articles to my own collection and now I'm going to share three of my favorites with you! Third, a carrick bend knot bracelet, made by me! Be a follower, and leave a comment, about... well anything, I suppose - just make sure I've got a way to contact you if you win! Be sure to let me know about any additional entries in the comments! Nautical! *gets sparkly eyes* So fun! Ahh!!!!! so cute!!!!! I'm entering : ) I love that scarf! and the bracelet is amazing! Cute, cute, cute! I love this giveaway!! I follow! And I agree, that Nautical stuff is my favorite trend right now. So cute! Oh! And I RT'd your giveaway Tweet! Great giveaway! I love your pose in the last pic! Congratulations to your first giveaway! I am already following you so I am in! I love it!!!! wow! your talented!!!! I would like to do a give away on my blog. But, I'll wait until i have more followers. People would love stuff from the middle east!!! oohhh yes please!!! i love them all but especially that scarf--to die for! I follow, cute bracelet you made. :-) and I've been looking for a striped scarf. will tweet and add the badge for extra entries now. fun giveaway! i love the nautical inspired trend and that scarf is just perfect! Oh I absolutely love nautical! It's one of my all-time favourite trends. And your cardigan is too cute. Haha, head to toe denim off the runway wouldnt be too hot! Love the nautical get up, totally fab! And the bracelet you have made is GORG! I just discovered your blog, and what a good time to find it! I'm a follower now :) Love this giveaway! Super cute! 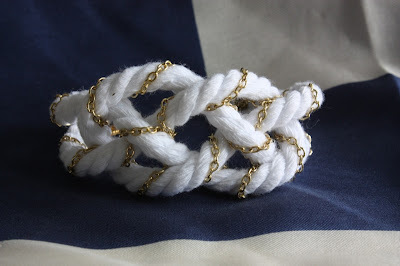 I love the carrick bend knot bracelet that you made! So cute! I am loving/needing nautical right now! 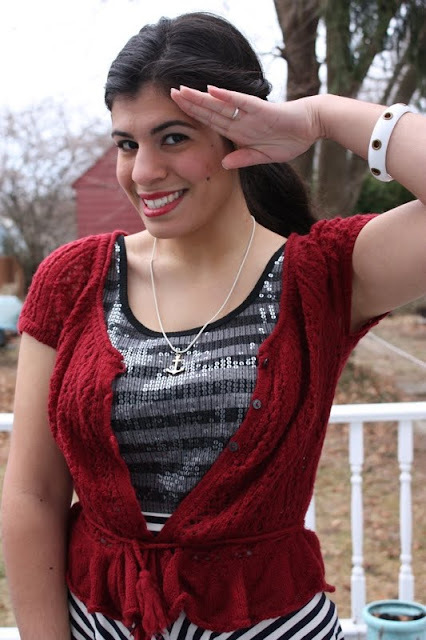 My favorite part about spring is the reintroduction of the nautical trend! The bracelet you made is so cute! On a side note, I didn't realize I wasn't following you yet! I am now! What a great giveaway! I love all things nautical! I'm a new follower!